Railroad bridges and train trestles can trace their roots back to the industry's beginnings in the mid-19th century. 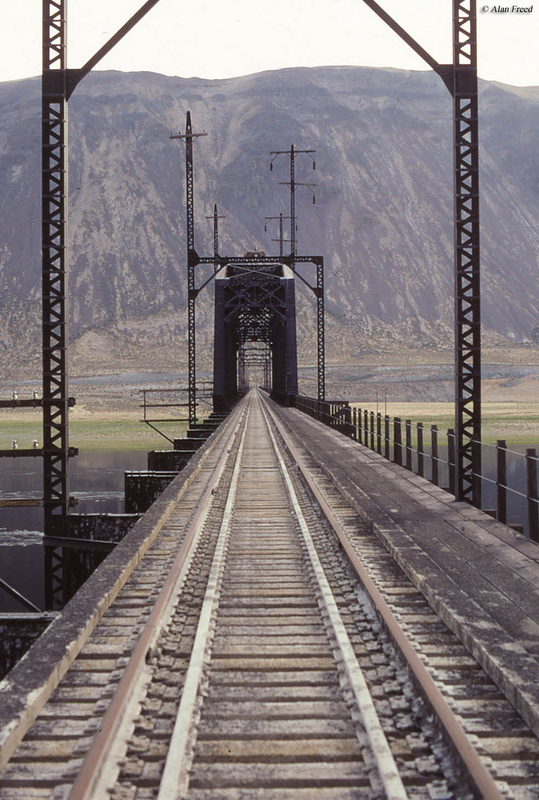 Prior to the development of iron, and later steel, early bridges were built of either stone or wood. During this time engineers designed some quite stunning, and perhaps somewhat harrowing, wooden bridges that appeared as if they might not hold a person let alone a heavy train. However, after iron and steel began to be widely employed in the latter 19th century new bridge designs were employed, the most common of these being trusses, beams, girders and spans. Today, many of the stone-arch bridges built in the mid-19th century remain in regular service due to their exceptional construction. 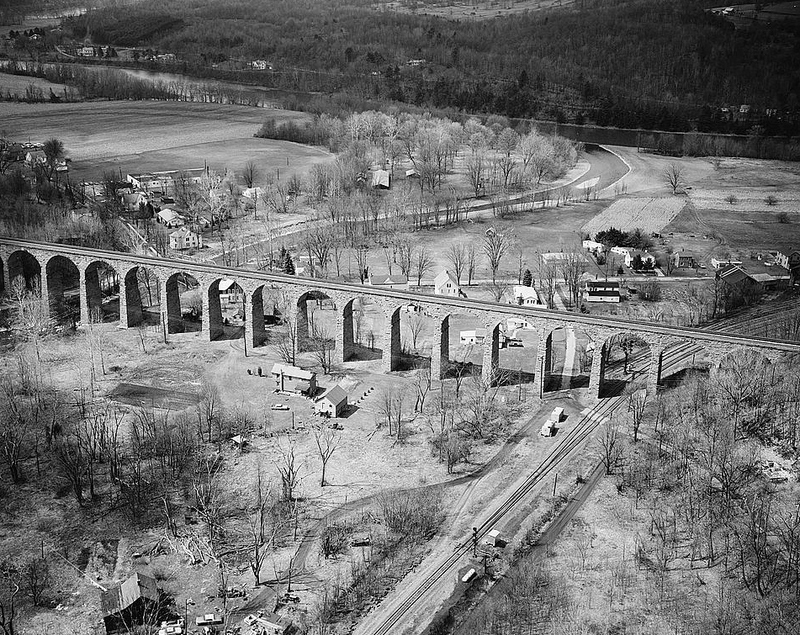 Additionally, most are also either on the National Register or National Historic Landmarks with names like the Thomas Viaduct in Maryland or the Starrucca Viaduct in northeastern Pennsylvania. One of the first railroad bridges to be built in the country is credited to the Baltimore & Ohio Railroad which constructed its Thomas Viaduct in 1835 located at Elkridge, Maryland over the Patapsco River. The bridge gained its name for the B&O's first president, Philip E. Thomas and at the time of its construction was the world's longest masonry bridge and the first curved structure of its kind. Even today it remains the largest bridge of its type and still carries regular freight and passenger trains to this day, a testament to the strength and longevity of not only its stone construction but also the masons who built it. Other famed stone bridges around the country include the Pennsylvania Railroad's Rockville Bridge near Harrisburg, Pennsylvania crossing the mighty Susquehanna River. This massive structure is 3,820 feet long and includes 48 arches. it opened in 1902 and still carries Norfolk Southern Railway freight trains and Amtrak passenger trains today. Although not built of stone it should be noted that one of the most famous arched railroad bridges in the country is the Delaware, Lackawanna & Western Railroad's Tunkhannock Viaduct. Topping out at 240 feet above the valley floor and roughly a half-mile long at 2,375 feet the railroad structure is a striking sight (made all the more impressive by Lackawanna R.R. located across the center arch). While stone bridges are renowned for their overall beauty and extremely long lifespans they are also very expensive to build. To help keep expenses down early railroads began engineering railroad bridges at first from wood and later from iron once it became available. 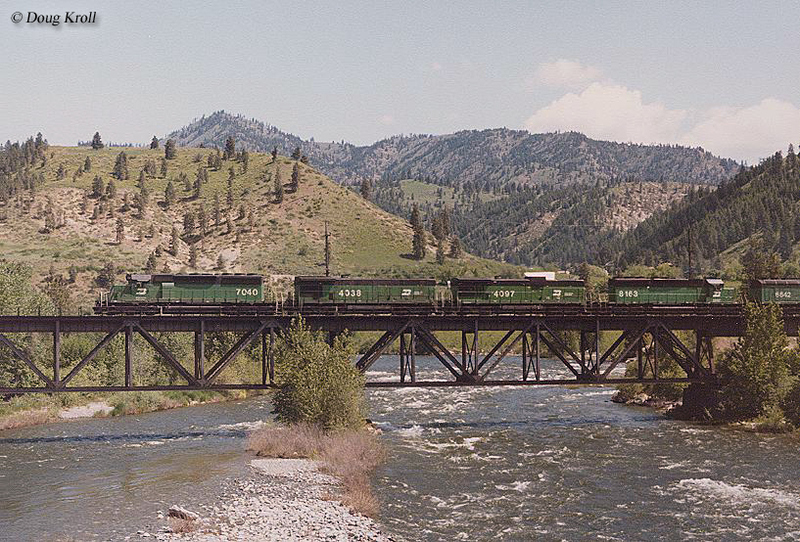 Some of the earliest engineered railroad bridges included differing truss designs such as the Burr arch truss of 1817 and own lattice truss of 1820. One of the most common early such designs once iron was available was the Pratt truss of 1844, patented by Thomas and Caleb Pratt, and the Warren truss of 1848. These designs can still be found on some railroad lines in the country even today (and some have or are in the process of being preserved). 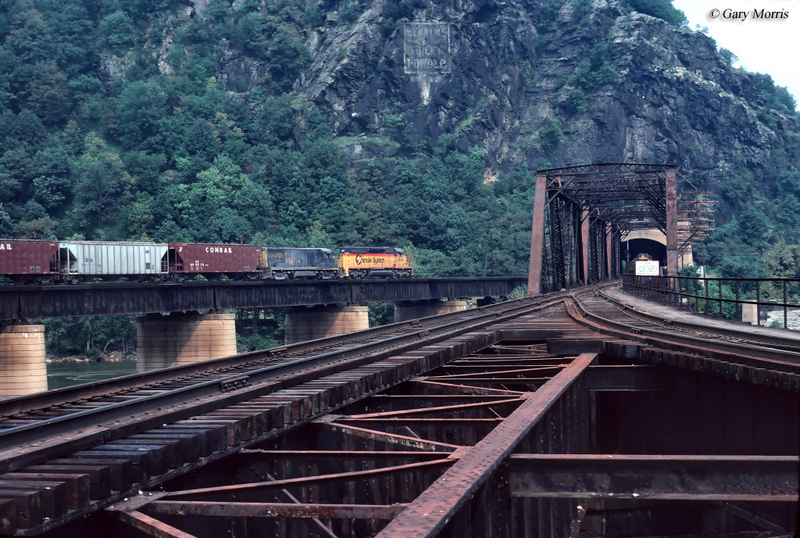 As steel became available in the late 1800s larger and more impressive railroad bridges were constructed. Virtually all of these were of designs already on the books, simply differing variations of them such as the cantilever truss and through arch design, the latter of which is perhaps most recognized as railroad bridges go in the New York, New Haven & Hartford Railroad's Hell Gate Bridge which connects Queens and Manhattan over the East River. This impressive structure was completed in September 1916 and remains an important artery for Amtrak and freight trains today. 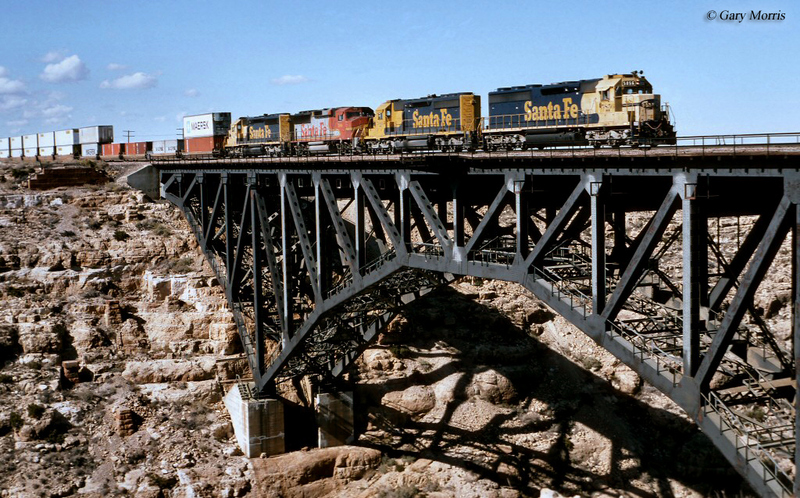 The most common railroad bridges are probably variations of the span plate girder designs. These bridges typically only span small streams, cuts or open areas and are relatively cheap and inexpensive to build. However, even some longer railroad bridges will be partially constructed of the span or girder design, it simply depends on how the engineer has drawn up the plans for a particular structure. For an excellent general overview of common railroad bridge designs please click here. Railroad bridges will forever be an important component of the railroad infrastructure which allows trains to cross the country because obviously without them we could never have spanned the smallest stream to largest valley. It should also be mentioned that several bridges are nearing the end of their useful lifespan and will need to be replaced soon (or already have been). Obviously, it is necessary that these bridges are rebuilt sooner rather than later not only to keep an accident from happening but also to keep the flow of goods back and forth across the country. So, when state or federal money is being authorized to help in the building of a private, new bridge it is certainly going towards a worthy cause and is not a waste of tax dollars as these structures are very expensive to construct, even for large railroads (several million dollars per bridge is common these days).